I harvested my first tomato today! It was a Sungold Cherry and boy did it taste like a bucketful of sunshine. Can’t wait for more! Looks like there will be a few ready in a couple of days. By the way, the gopher garden is looking ok. The lettuces don’t seem to have cared about moving. They actually seem to be doing better with a little more shade then they had before. The tomatoes look slightly yellower, but not dying. The only plant that seems to have noticed is the cucumber which has almost completely turned yellow. I’m hoping it will survive, but if not I planted two more in the front yard that are doing well. Have you harvested any summer veggies yet? Basil! I’ve made my first batch of pesto already; the basil was threatening to flower. 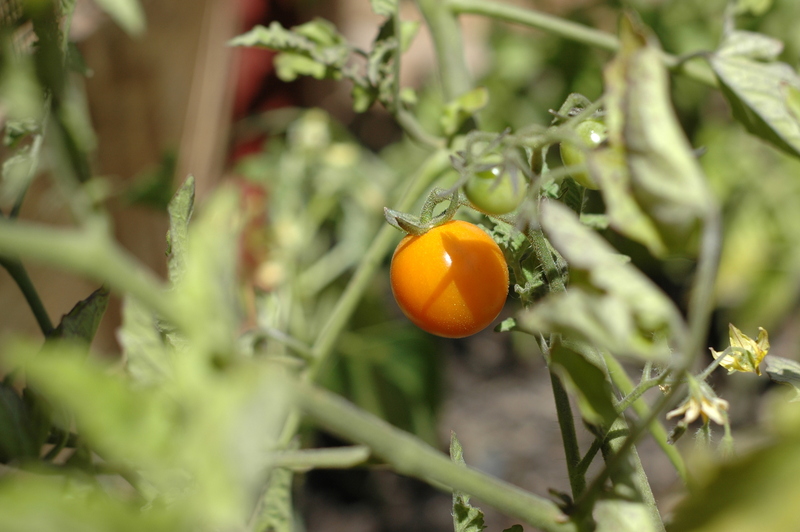 There’s always something special about that first tomato! Here in Florida, summer is actually a hard time to grow things. I still have green beans coming in, but not much else.